One of the oldest architectural ensembles of Saint Petersburg, Alexander Nevsky Lavra, was founded in 1710 on that very place where according to the legend Alexander Nevsky defeated Swedish troops. The construction works lasted for almost a century and was finished only by 1790. During that period several talented architects changed one another. Among them one should mention D. Trezini, T. Shvertfeger, M. Zemtzov, L. Pustoshkin, F. Korolev, P. Eropkin, M. Rastorguev, I. Starov. But although each of them introduced something new into the project they didn't change the main idea of Tresini who designed monastery as a complex of residences, institutions and palace constructions. The compositional center of Lavra is the Holy Trinity Cathedral, constructed by architect Starov. The end of the construction works and the sanctification of the cathedral in 1790 marked the end of the forming of the Alexander Nevsky Lavra ensemble. The monumental cathedral is crowned with a high dome and harmonizes well with the surrounding monastery buildings. Among the icons of the cathedral the one most honored is the icon of Saint Serafim Sarovsky. In 1724 the remains of Saint Alexander Nevsky who had been canonized by the Orthodox Church as the Holy Patron of Russia were transferred to the monastery. By the end of the 18th century the Alexander Nevsky monastery that in 1797 was elevated to the status of Lavra (Lavra is a name given to rich monasteries of the highest rank enjoying special privileges), became the spiritual and cultural center of Saint Petersburg. All Russian empresses and emperors protected and sponsored the Lavra. Already under Peter the Great on the territory of the monastery a hospital, a charity house for the poor, a printing house and the school for the children of priests were established. Later the school was transformed into the Theological Seminary and then into the Theological Academy, famous for the high level of education it provided. Thus the Alexander Nevsky Lavra became the ecclesiastical educational center of the Saint Petersburg eparchy. Since there were only four monasteries of such a status in Russia before the Revolution, it is easy to imagine the important role the Alexander Nevsky Lavra played in the life of Saint Petersburg and the country.From the very beginning the Alexander Nevsky Lavra got the status of the most prestigious burial place in Imperial Russia. The members of royal family, priests, outstanding governors and commanders were buried there. Among them one should name Commander Suvorov, prince Bezborodko, architects Quarenghi, Voronikhin, Rossi and others. After the Revolution of 1917 the monastery was abolished and its churches were closed by the Soviet authorities. Numerous relics and works of art were given over to the Russian Museum, the State Hermitage and other Saint Petersburg museums. In 1936-1937 on the territory of the monastery the museum was created. It was called Leningrad Necropolis and in 1939 was transformed into the Museum of Urban Sculpture. The Holy Trinity Cathedral was returned to Russian Orthodox Church only in 1956 and in 1987 the divine services were resumed in Nikolskaya Church. 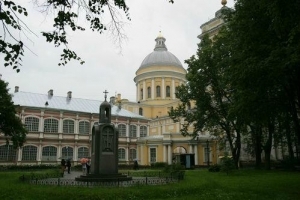 At the beginning of the 20th century there were about 12 churches on the territory of the Lavra. Nowadays there are only two of them that are open. The revival of monkery happened in autumn 1996 and today the Alexander Nevsky Lavra is a functioning monastery of Saint Petersburg eparchy.